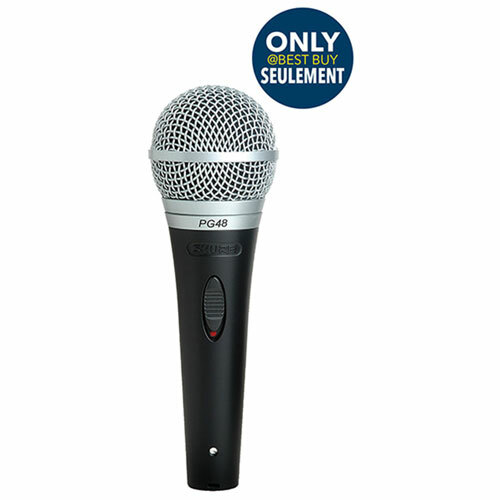 Whether you're performing a song or giving a speech, you can ensure your voice is heard loud and clear with the Shure PG48-LC cardioid dynamic vocal microphone. Designed specifically for vocal applications, this microphone picks up the most sound from the front of the mic and some sound from the sides. The steel mesh ball grill with "pop" filter helps minimize breath sounds and wind noise. Bought this for my girlfriend to use when she is singing small gigs. Sounds great looks good is durable and sounds even better with the pop screen we added. Great buy for the value. Used for a PA system at work. Is just fine for that use. I bought this MIC for recording acoustic guitar and singing at home. It works perfectly and I don't need to be to close to MIC when recording. Crystal clear sound, very happy. Working great, a month after purchasing the mic still work great. Sound is good and it feels solid. I bought it for my 7 and 9 year olds (and me) singing at home for fun (hook up to back of a keyboard). I had studio Sony dynamic mics decades ago before coming to this country, so I bought this, the cheapest Shure mic but still very good. I used to play flute, saxophone and guitar, but I'm not a professional musician (I'm an engineer. 'Good and cheap' is my motto). I also bought Digiflex mic cable (N10-XFS) and windscreen (not included with PG48). Windscreen will act as shock absorber on a hardwood floor for accidental drops.